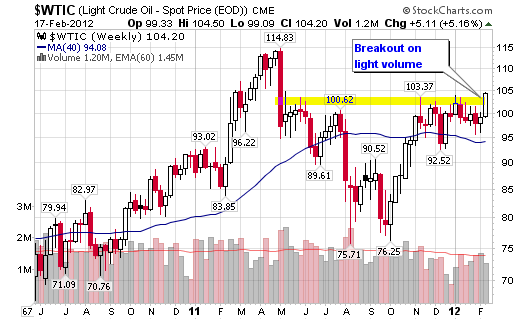 Market Pullback and Energy Opportunities in COP and BP? That was my tweet from Thursday, February 9, 2012. The signs that I was referring to are located in the following two charts. 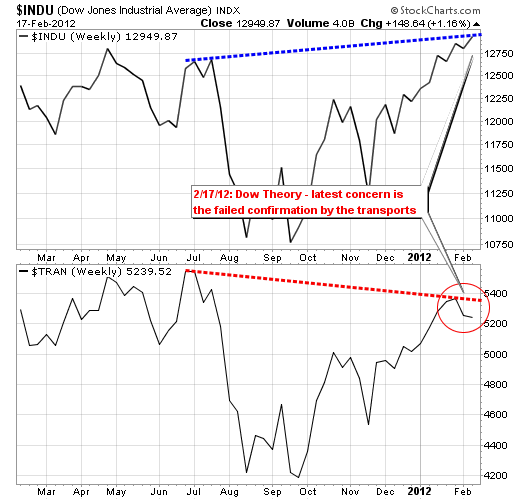 The divergence over the past month is very clear on the charts below as the transports are showing weakness in comparison to the industrials. I am not calling a market reversal or downtrend but I am seeing some exhaustion among the leaders and major market averages. 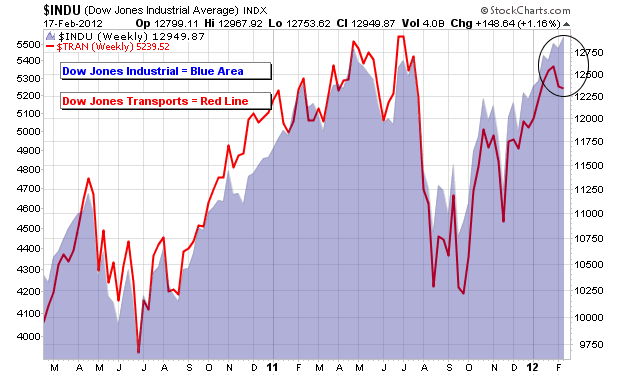 Recent gains need to be digested before moving higher (if that’s where 2012 is headed). 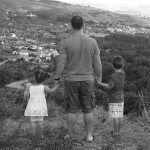 Oil has become a topic of interest with gasoline prices across America making headline news on a daily basis. With crude oil pushing higher, above $100, I have become interested in two dividend plays that also present solid technical charts. 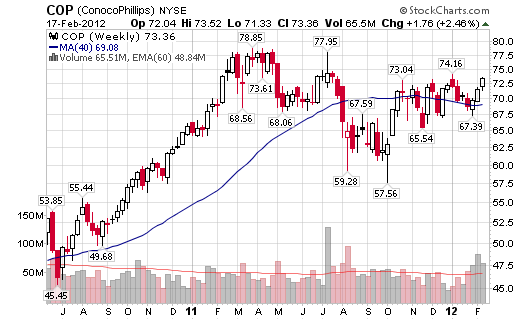 ConocoPhillips ($COP – $73.36) operates as an integrated energy company worldwide. The company’s Exploration and Production (E&P) segment explores for, produces, transports, and markets crude oil, bitumen, natural gas, liquefied natural gas, and natural gas liquids. The company has a market cap just shy of $100B, an annual dividend of $2.64/3.60%, 65% held by institutional investors and a P/E of 8.17x. 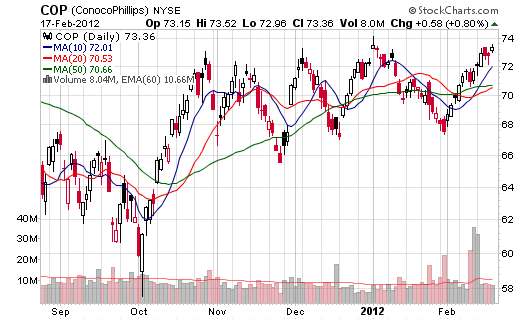 A move to new highs could catapult the stock well into the $80 range (along with that dividend). The company has been experiencing an increase in net income, year over year revenue growth and a solid record of earnings growth. One could argue that the ideal entry is closer to the 50-d moving average. BP p.l.c. 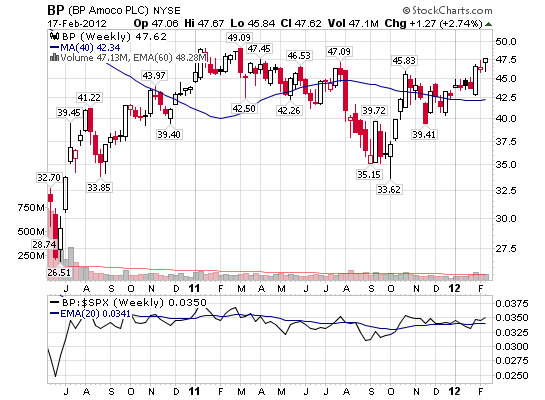 ($BP – $47.62) provides fuel for transportation, energy for heat and light, retail services, and petrochemicals products. Its Exploration and Production segment engages in the oil and natural gas exploration, field development, and production; midstream transportation, and storage and processing; and marketing and trading of natural gas, including liquefied natural gas (LNG), and power and natural gas liquids (NGL). The company has a market cap of $150B, an annual dividend of $1.92/4.03%, 10.68% held by institutional investors and a P/E of 5.90x. 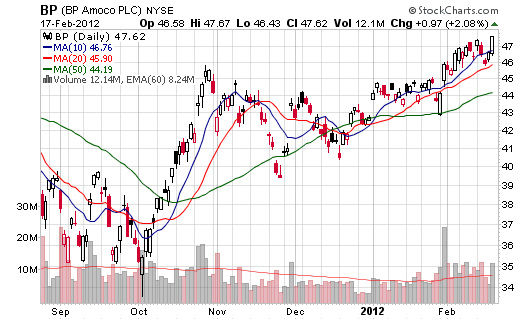 A move to new highs could push the stock back towards pre- “Gulf of Mexico” disaster levels (along with that dividend). The company has been experiencing increasing net income, growing revenues, reasonable debt and future potential with new contracts and repaired brand image. As with $COP, an ideal entry for $BP is closer to the 50-d moving average but we are targeting these stocks as value plays considering their dividends and low PE’s.